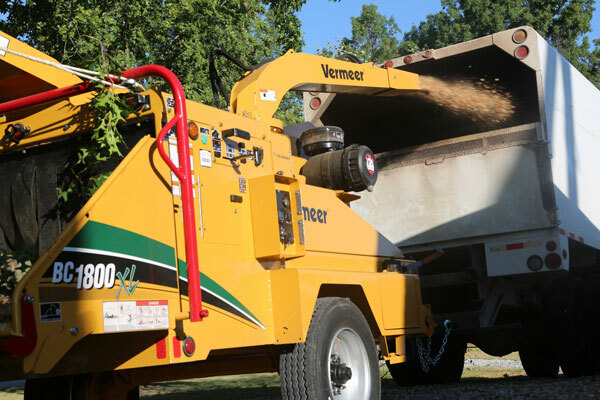 The Vermeer Tree Commander remote control comes standard with the BC1800XL gas brush chipper. From the remote, the operator can control all brush chipper functions for even more productivity. The remote can either attach to the user’s belt or be mounted directly onto the operator’s station of a Vermeer mini skid steer. The BC1800XL gas chipper’s 67-inch (170.2 cm) wide feed table provides ample room for material. There is a four-position upper feed control bar mounted over the feed table that enables the operator to stop the feed rollers and select forward or reverse. A patented bottom feed stop bar that disables hydraulic flow to the feed rollers when contact is made provides additional operator protection.